During March, I'm going to highlight some of my favorite monogrammed finds for you. Earlier this week, I introduced you to some gorgeous Monogrammed Tunics. You're going to love what I have to share with you today. It's never too early to start to think about the beach, right? 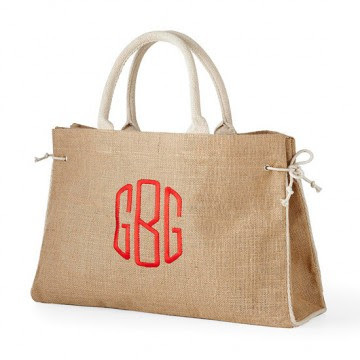 The Monogrammed Burlap Tote With Ties is perfect to take to the beach and looks equally stunning in town or at dinner. Available in a myriad of monogram styles and colors, there is a bag for every taste and style. The price point is amazing, too! That tote is so pretty! I love it! Isn't this tote the bees knees??? Love the bag and love the price! This is so gorgeous, and is going to make the perfect Mothers day gift!